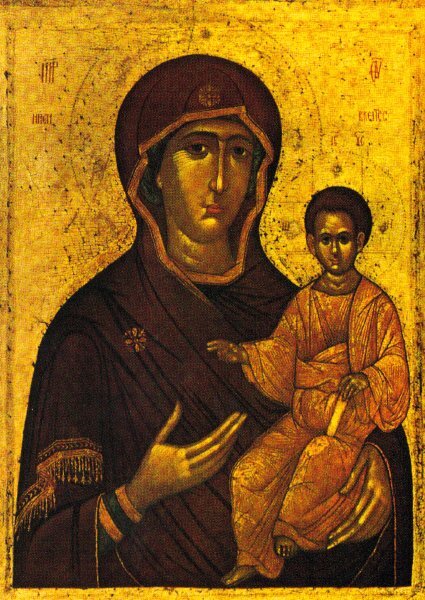 The Blakhernai Icon of the Mother of God was discovered at Jerusalem by the empress Eudokia during the time of Sainted Juvenal, Patriarch of Jerusalem (Comm. 2 July), and the Monk Euthymios the Great (Comm. 20 January). The holy icon was sent to Constantinople, where the empress Pulcheria set it within the Blakernai Church, there where was preserved the Venerable Robe of the Mother of God (celebrated 2 July). This holy icon is also called the "Hodegetria", that is, "Putevoditel'nitsa" or "Way-Guide". And in particular it was with this icon that Patriarch Sergios (610-631) made the rounds of the walls of Constantinople in the year 626 with moliebens during a siege of the capital by the Avars. In memory of this and other victories, gained thanks to the intercession of the MostHoly Virgin, there was established annually on Saturday of the Fifth Week of Great Lent to celebrate a feast of Praise to the MostHoly Mother of God ("Saturday Akathist"). At first the celebration was done only at the Blakhernai temple at Constantinople. In the IX Century the feast was included in the ustav (rule) of the Monk Sava the Sanctified and in the Studite ustav, but later was included in the Lenten Triodion and made universal for all the Orthodox Church. After the fall of Constantinople in 1453, the Blakhernai Icon was transferred to Athos, and in 1654 it was sent by the Athos monks to Moscow as gift to the tsar Aleksei Mikhailovich. The celebration of the Blakhernai Icon is done also on 2 July (on feast of the Robe-placing) and in the Saturday Akathist -- on the Fifth Week of Great Lent.